We invite your firm/company to sponsor BALIF, the oldest and largest LGBTQI Bar Association in the country, and the 39th Annual BALIF Gala! Click here to purchase sponsorship online! Supporting BALIF supports BALIF’s work on amicus briefs, resolutions to the Conference of Delegates of California Bar Associations, the appointment of LGBTQI attorneys to public service and leadership (including the judiciary, public agencies, and public commissions), and BALIF’s community activism and service projects. BALIF supports diversity in the legal profession by providing critical LGBTQI networking opportunities, including an attorney mentorship program that connects law students and junior lawyers with more experienced attorneys. BALIF strengthens the LGBTQI and other marginalized communities by partnering with other minority bar associations and organizations on social action initiatives, social events, scholarships/fellowships, and MCLE courses. For your sponsorship, your firm/company will receive the benefits listed below, including complimentary tickets to the 39th Annual BALIF Gala. 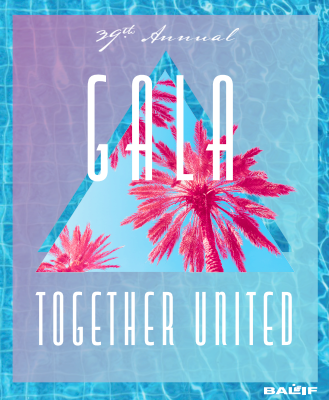 The Gala, BALIF’s largest annual event, boasts over 600 attendees, including lawyers, in-house counsel, judges, lawmakers, law students, and other legal and local luminaries. The 2019 Gala will be held on Friday, March 1, 2019, at the Bently Reserve located at 301 Battery Street in San Francisco. • Banner recognition as a Partner-level sponsor through the end of calendar year 2019 on the BALIF website, in the BALIF newsletter, and recognition at all BALIF sponsored functions, including your firm’s logo to be displayed at the Gala event, at MCLE events, monthly networking receptions, and other functions. • Admission to BALIF’s VIP reception before the Gala with in-house counsel, judges, the BALIF Board of Directors, National LGBTQI Bar Association Board members, and other legal and local luminaries. • Priority recognition as a Counsel-level sponsor through the end of calendar year 2019 on the BALIF website, in the BALIF newsletter, and at all BALIF sponsored functions, including your firm’s logo displayed at the Gala event, at MCLE events, monthly networking receptions, and other functions. • Recognition as an Advocate-level sponsor through the end of calendar year 2019 on the BALIF website, in the BALIF newsletter, and in all printed and online 2019 Gala materials. • Recognition as a Benefactor-level sponsor through the end of calendar year 2019 on the BALIF website, in the BALIF newsletter, and in all printed and online 2019 Gala materials. • Recognition as an Individual sponsor through the end of calendar year 2019 on the BALIF website, in the BALIF newsletter, and in all printed and online 2019 Gala materials. If you are interested in sponsoring BALIF at an even greater level than those listed above, please feel free to contact us directly at the email address below or you can call our Office Administrator Katie Carlson, at 415.874.3045. Your firm/company may also participate in a limited number of additional sponsorship opportunities at the 2019 Gala event, including naming and branding recognition at various food, drink, and entertainment stations throughout the event, sponsoring the VIP Reception, and sponsoring the official Gala After-Party, likely in the Castro District of San Francisco. Prices for these additional sponsorship opportunities will range from $500 to $5,000+. Because these additional sponsorship opportunities are limited in number, please contact us as soon as possible if you are interested in any of these opportunities. For your sponsorship and advertisement to appear in the 2019 Gala program, you must respond, and your payment must be received, by Friday, February 8, 2019 at 5:00 p.m. If you should encounter any problems, please do not hesitate to contact us. We hope that you will become a BALIF sponsor this coming year and look forward to seeing you at the 2019 Gala as we celebrate 38 years of fun and festivities!